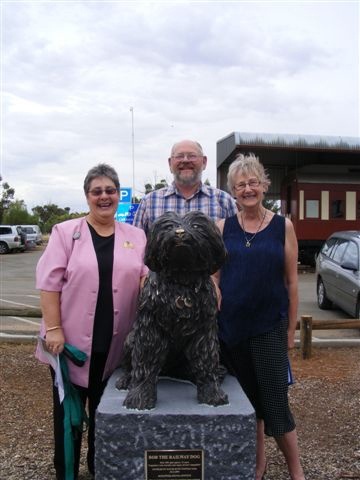 A life size bronze statue of Bob the Railway Dog by noted SA sculptor Silvio Apponyi was unveiled in Peterborough November 20, 2009 by the Mayor of Peterborough, Ruth Whittle OAM - the result of 18 months of fundraising by the local and wider community and coordinated by Heather Parker of the Peterborough History Group SA Inc.
His return to Peterborough, his early home has been warmly welcomed. Tokens, - bones, dog biscuits, Christmas presents and Easter eggs are often to be seen between his front paws. And he is suitably dressed for special occasions – Australia day, Valentine’s day, Rodeo weekend, etc.- by anonymous admirers. He has become a great favourite with travellers passing through Peterborough and appears in many family holiday snaps. Silvio Apponyi is an Australian sculptor based in Balhannah in the Adelaide Hills, South Australia. Silvio has been sculpting for around 40 years. His style has developed over these years, from entirely abstract creations still used in fine details and larger pieces, to an astonishing level of detail and realism, visible in the images on this website. His main inspiration is Australian fauna, and he hopes to draw attention to these unique and often endangered species. In his self built studio Silvio creates his sculptures in a variety of media, primarily wood, Australian granites & marbles and bronze. His scupltures range from delicate ‘Netsuke’ style pieces to massive public granite works. Silvio began carving at an early age and was awarded the Sculpture Prize in his last year at High School. He then did a 4 year Diploma of Fine Art at the South Australian School of Art, majoring in Sculpture. Upon completion he was awarded a German exchange scholarship and he spent a year in the Munich Academy of Fine Arts. When he returned to Australia he continued to develop his skills and in 1982 devoted himself fulltime to his art. Since then he has had one-man shows and group exhibitions locally, interstate and overseas. He has won several prizes,accepted commissions, conducted workshops in Australia and Malaysia, and studied wood-block printmaking under a Japanese master. 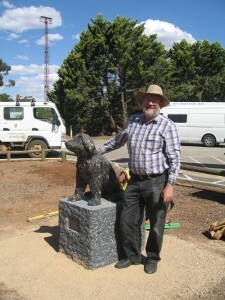 His work is featured in many private collections both here and overseas and in public spaces across Australia.